Shortly after reading Phil Weiss' "Trivializing the anti-Semitism charge" post on Mondoweiss, I came across this new Daily Beast article about the Israeli habit of trivializing the Holocaust. The article stems from the recent ultra-Orthodox rallies in Jerusalem which mimicked and exploited iconic Holocaust imagery to protest "an effort by secular Israelis to roll back gender segregation on some bus lines and in certain neighborhoods—a dispute that has surged in recent weeks." 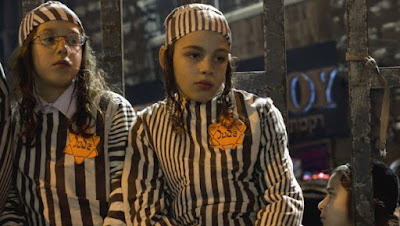 The article's author, Dan Ephron, writes that "even as Israel zealously guards the memory of the genocide, many Israelis invoke it frivolously in a manner that can seem shocking to outsiders and might even be illegal in some countries (the EU has a provision against trivializing the Holocaust, as do several European countries individually)." In its more benign form, Israelis might talk about the 1967 line that divides Israel and the West Bank as "the Auschwitz border," or equate Iranian President Mahmoud Ahmadinejad with Adolf Hitler. Bauer recalls that during Israel’s Lebanon war in 1982, Prime Minister Menachem Begin famously likened the blockade against PLO leader Yasir Arafat in Beirut to the siege on Hitler's bunker near the end of World War II. That Ephron uses the word "benign" to describe these ridiculous comparisons is either proof of his own trivialization of the very thing he is seeking to sanctify or, more likely, evidence that he just doesn't know the definition of the word "benign" (kindly, generous, gentle, benevolent). Surely, a benign reading of Ephron's word choice would be to assume he meant "banal" instead (i.e. commonplace, mundane, trite, bromidic, clichéd). ...it's not uncommon to hear Israelis refer to other Israelis as Nazis as well. Jewish settlers regularly use the term against Israeli soldiers in the West Bank, as when troops are sent to dismantle unauthorized outposts. The late Yeshayahu Leibowitz, a well-known left-wing intellectual, once described settlers as “Judeo-Nazis.” Israeli traffic cops occasionally complain they’re called Nazis by the motorists they pull over. Holocaust historian and Yad Vashem academic adviser Yehuda Bauer explains to Ephron, "People in Israel misuse the Holocaust in politics and other areas all the time," lamenting, "The comparisons tend to dilute the real significance of the Holocaust." Still, the comparisons abound. Just today, a new headline at Ha'aretz reveals that Israeli Justice Minister Yaakov Neeman has "a very hostile attitude toward the media, reportedly calling Haaretz 'Der Sturmer' - the Nazis' propaganda paper." "Israel is a traumatized society that is thrown back onto the trauma all the time," he tells The Daily Beast. "When a society is traumatized like that, any opponent or perceived enemy is immediately equalized with the worst enemy Israel ever had." Read that again. There are two important aspects of Bauer's observation. First is the unassailable truth that the idea of perpetual and singular victimhood pervades Jewish Israeli society (and perhaps the American and European Jewish communities at large). Peter Beinart, in his much-discussed 2010 New York Review of Books article, noted "In the world of AIPAC, the Holocaust analogies never stop, and their message is always the same: Jews are licensed by their victimhood to worry only about themselves." Last year, Israeli Prime Minister Netanyahu used a nearly identical formulation in his speech to an obsequious U.S. Congress. "As for Israel, if history has taught the Jewish people anything, it is that we must take calls for our destruction seriously," he bellowed. "We are a nation that rose from the ashes of the Holocaust. When we say never again, we mean never again. Israel always reserves the right to defend itself." As this writer has pointed out before, Netanyahu's turn of phrase is ironic considering the title of former Knesset speaker Avraham Burg's 2008 book, "The Holocaust Is Over; We Must Rise From Its Ashes," in which Burg exposes the purpose of playing the victim. "Victimhood sets you free," he writes. Furthermore, over thirty years ago, in 1980, Israeli journalist Boaz Evron put it another way: "If we assume the world hates us and persecutes us, we feel exempted from the need to be accountable for our actions towards it." the Palestinians are suffering from several cruel strokes of fate: The people that oppress them claim for themselves the crown of ultimate victimhood. The whole world sympathizes with the Israelis because the Jews were the victims of the most horrific crime of the Western world. That creates a strange situation: the oppressor is more popular than the victim. Anyone who supports the Palestinians is automatically suspected of anti-Semitism and Holocaust denial. The second interesting aspect of Bauer's concluding quote is that the Nazis, who were in power from 1933 to 1945, are described as "the worst enemy Israel ever had." Israel was founded in 1948. Bauer is clearly - though perhaps unconsciously - equating "Israel" with "Jews" and utilizes his own Holocaust reference to reimagine history and erase Palestinian existence altogether. In so doing, Bauer conforms his worldview to the epitome of Netanyahu's Zionist chauvinism: Israel is a "Jewish State" that rose from the ashes of the Holocaust, rather than one built - violently, colonially, and deliberately - atop the ruins of Palestine. UPDATE: Obviously, though not mentioned in the above piece, the foremost authority, commentator and critic of the Zionist misuse/overuse/exploitation of the Holocaust is Professor Norman Finkelstein, author of The Holocaust Industry. The use and manipulation of the Holocaust trope and how it was and is still being exploited by neoconservative warmongers (first with regard to the invasion of Iraq and now with the drumbeat to war with Iran) was comprehensively and expertly examined by Gary Kamiya in a piece entitled "The boys who cry 'Holocaust'", published by Salon.com on November 22, 2011. I cannot recommend this article more highly. It is phenomenal. The subject, along with the "anti-Semitism charge," is also examined excellently in Israeli filmmaker Yoav Shamir's documentary Defamation. Oh right Nima, keep criticizing Israel. When is your criticism of the Islamic Republic? For every Israeli post, I expect 9-10 articles from you criticizing Khamenei and the Islamic Republic. If not, your ideology lies elsewhere. Such fun to see that Norman F. clip. He's a force, but also really amusing--a nice combination.